Along with building the @UK Sailmakers group, Butch is well known as a competitor on the race course and race organizer. 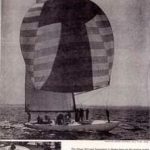 His sailing career spans 60 years in which he has competed in everything from 12-foot dinghies to 84-foot ocean racers. He has won the national championships in several one-design classes and has competed in 17 Newport-Bermuda Races (18 after this year), he has raced transAtlantic, the Fastnet, Buenos Aires to Rio, Miami to Nassau and seven Marblehead to Halifax races. His first Bermuda Race was in 1958 on a US Naval Academy yawl that was engine-less.